Rachid Kassim was a French citizen and foreign fighter for ISIS. French authorities have connected Kassim to numerous thwarted or successful terrorist attacks there.“Did jihadist Rashid Kassim lure French youths to plot attacks?” BBC News, September 15, 2016, http://www.bbc.com/news/world-europe-37340697. In July 2016, Kassim appeared in an ISIS propaganda video in which he beheaded an ISIS captive, threatened French President François Hollande, and called for attacks against French citizens.“Did jihadist Rashid Kassim lure French youths to plot attacks?” BBC News, September 15, 2016, http://www.bbc.com/news/world-europe-37340697. 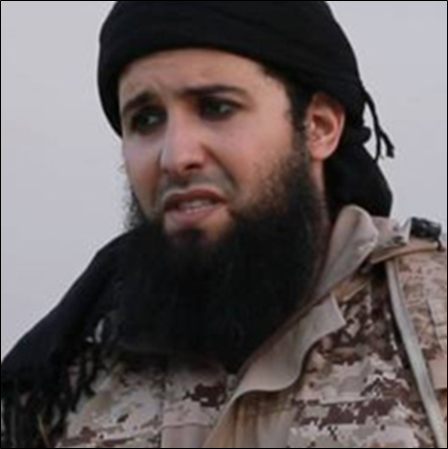 He was killed in a U.S. drone strike in Mosul sometime between February 7 and 10, 2017.Thomas Gibbons-Neff, “Rachid Kassim, ISIS recruiter and failed rapper, targeted in U.S. airstrike,” Washington Post, February 10, 2017, https://www.washingtonpost.com/news/checkpoint/wp/2017/02/10/rachid-kassim-isis-recruiter-and-failed-rapper-targeted-in-u-s-airstrike/?utm_term=.fb2a166057e5. Amarnath Amarasingam, “An Interview with Rachid Kassim, Jihadist Orchestrating Attacks in France,” Jihadology, November 18, 2016, http://jihadology.net/2016/11/18/guest-post-an-interview-with-rachid-kassim-jihadist-orchestrating-attacks-in-france/. Upon returning to France, the imam at his local mosque reportedly threatened to dismiss Kassim from the congregation for his extremist rhetoric.“Ce que l’on sait de Rachid Kassim,” Le Point (Paris), last modified September 12, 2016, http://www.lepoint.fr/societe/ce-que-l-on-sait-de-rachid-kassim-12-09-2016-2067726_23.php. In the subsequent months, Kassim reportedly began rapping and writing songs with titles including “I’m a terrorist” and “Rap attack.”“Did jihadist Rashid Kassim lure French youths to plot attacks?” BBC News, September 15, 2016, http://www.bbc.com/news/world-europe-37340697. In 2012, Kassim traveled with his wife and three children to Syria via Egypt in order to fight alongside extremist groups.“Did jihadist Rashid Kassim lure French youths to plot attacks?” BBC News, September 15, 2016, http://www.bbc.com/news/world-europe-37340697. He claimed in one interview that police were monitoring him while he lived in France, following him while he jogged, watching his house, and living in his building.Amarnath Amarasingam, “An Interview with Rachid Kassim, Jihadist Orchestrating Attacks in France,” Jihadology, November 18, 2016, http://jihadology.net/2016/11/18/guest-post-an-interview-with-rachid-kassim-jihadist-orchestrating-attacks-in-france/. Despite this scrutiny, Kassim managed to travel with his wife and child to Syria via Turkey in early 2015 in order to fight alongside ISIS.“Did jihadist Rashid Kassim lure French youths to plot attacks?,” BBC News, September 15, 2016, http://www.bbc.com/news/world-europe-37340697. “Did jihadist Rashid Kassim lure French youths to plot attacks?” BBC News, September 15, 2016, http://www.bbc.com/news/world-europe-37340697. “Rachid Kassim, el exrapero yihadista más buscado por los servicios de inteligencia de Francia,” Agence France-Presse, September 15, 2016, http://www.univision.com/noticias/yihadismo/rachid-kassim-el-exrapero-yihadista-mas-buscado-por-los-servicios-de-inteligencia-de-francia. Among these individuals was Larossi Abballa, a member of Kassim’s Telegram group chat who murdered a police officer and his wife in Magnanville, France, on June 13, 2016. While in the victims’ house, Abballa broadcast his pledge of allegiance to ISIS via Facebook.“Who was French Police Murder Suspect Abballa?” BBC News, June 14, 2016,http://www.bbc.com/news/world-europe-36526067. Investigators believe that Kassim also communicated with Abdel-Malik Petitjean and Adel Kermiche, two French citizens who murdered an elderly priest in Normandy on behalf of ISIS on July 26, 2016. Both men were reportedly members of Kassim’s group chat, and investigators believe that Kassim introduced Petitjean to Kermiche and instructed the two to murder the priest. Officials also connected Kassim to Ines Madani, Sarah Hervouet, and Amel Sakaou, three French women arrested in September 2016 for leaving a car filled with explosives next to the Notre Dame Cathedral. After their arrest, Kassim shamed his male followers on Telegram, reportedly asking, “Where are the brothers...You have to understand, if women are taking actions it’s clearly because too few men are acting.”“Did jihadist Rashid Kassim lure French youths to plot attacks?” BBC News, September 15, 2016, http://www.bbc.com/news/world-europe-37340697. Amarnath Amarasingam, “An Interview with Rachid Kassim, Jihadist Orchestrating Attacks in France,” Jihadology, November 18, 2016, http://jihadology.net/2016/11/18/guest-post-an-interview-with-rachid-kassim-jihadist-orchestrating-attacks-in-france/. On February 28, 2017, three French teenage girls were also arrested for plotting terror attacks on French soil. The three girls, who called themselves ‘les lionnes’ (the lionesses) were arrested in separate raids after having been in communication with Kassim through Telegram.“French high school girls nicknamed ‘the lionesses’ held over suspected terror plot,” The Local, February 28, 2017, https://www.thelocal.fr/20170228/france-high-school-girls-held-over-suspected-terror-plots. On May 2, 2017, another suspected terrorist was arrested in Roanne, France, as part of a nation-wide string of arrests carried out by French counterterrorism units. The suspect claimed to have been close to, and influenced by, Kassim.“Antiterrorism: support from jihadist Rachid Kassim arrested in Roanne,” Le Progres, May 2, 2017, http://www.leprogres.fr/loire/2017/05/02/un-proche-de-rachid-kassim-arrete-a-roanne. Ibn Qassim“Did jihadist Rashid Kassim lure French youths to plot attacks?” BBC News, September 15, 2016, http://www.bbc.com/news/world-europe-37340697. Rachid Kassim was a French citizen and foreign fighter for ISIS. “It is simple, if they take Mosul and Raqqa, we’ll find a way, but for sure we’ll never stop fighting. Even if we’re living in caves in the mountains, the fight will go on. Jihad existed before and during the Islamic State, and it’ll be here after the Islamic State.” (Telegram)Amarnath Amarasingam, “An Interview with Rachid Kassim, Jihadist Orchestrating Attacks in France,” Jihadology, November 18, 2016, http://jihadology.net/2016/11/18/guest-post-an-interview-with-rachid-kassim-jihadist-orchestrating-attacks-in-france/. “To behead an animal, it would be difficult, with enemies of Allah, it is a pleasure.” (Telegram)Amarnath Amarasingam, “An Interview with Rachid Kassim, Jihadist Orchestrating Attacks in France,” Jihadology, November 18, 2016, http://jihadology.net/2016/11/18/guest-post-an-interview-with-rachid-kassim-jihadist-orchestrating-attacks-in-france/. “A lot of us are jealous of brothers who attack in dar ul-kufr [non-Muslim countries].”Amarnath Amarasingam, “An Interview with Rachid Kassim, Jihadist Orchestrating Attacks in France,” Jihadology, November 18, 2016, http://jihadology.net/2016/11/18/guest-post-an-interview-with-rachid-kassim-jihadist-orchestrating-attacks-in-france/. “We believe that even a small attack in dar ul-kufr [the land of non-believers] is better than a big attack in Syria. As the door of hijrah [migration] closes, the door of jihad opens. If I stayed in dar ul-kufr, I would do an attack there.”Amarnath Amarasingam, “An Interview with Rachid Kassim, Jihadist Orchestrating Attacks in France,” Jihadology, November 18, 2016, http://jihadology.net/2016/11/18/guest-post-an-interview-with-rachid-kassim-jihadist-orchestrating-attacks-in-france/.